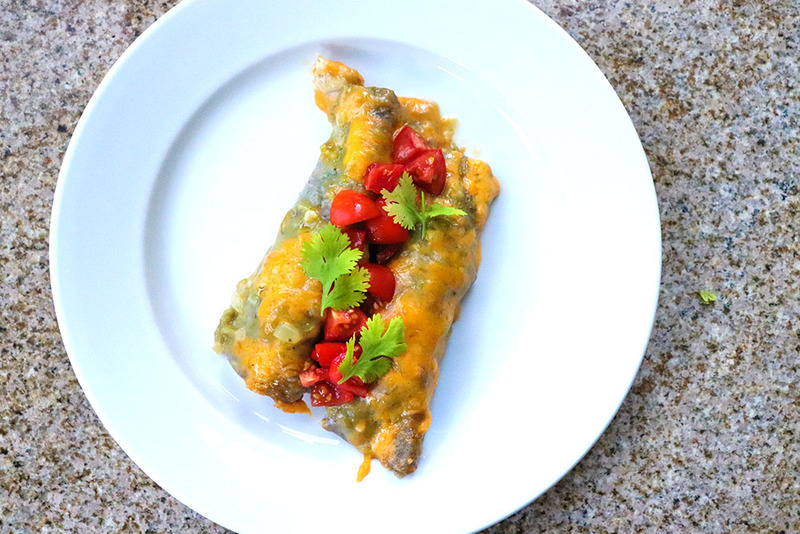 Want to learn how to make Blue Corn Green Chile Chicken Enchiladas? Keep reading for step-by-step instructions! And I feel like you can’t go wrong with any of these combinations! It wasn’t until I moved to Albuquerque, and went on a date at the Range Cafe, that I realized blue corn enchiladas were a thing. I am always fascinated with new food items, so I perked up when I heard my date order the blue corn enchiladas. Blue corn? That sounds fun, I thought! They’re like regular corn tortillas, but a really beautiful, un-dyed blue. I was all in. 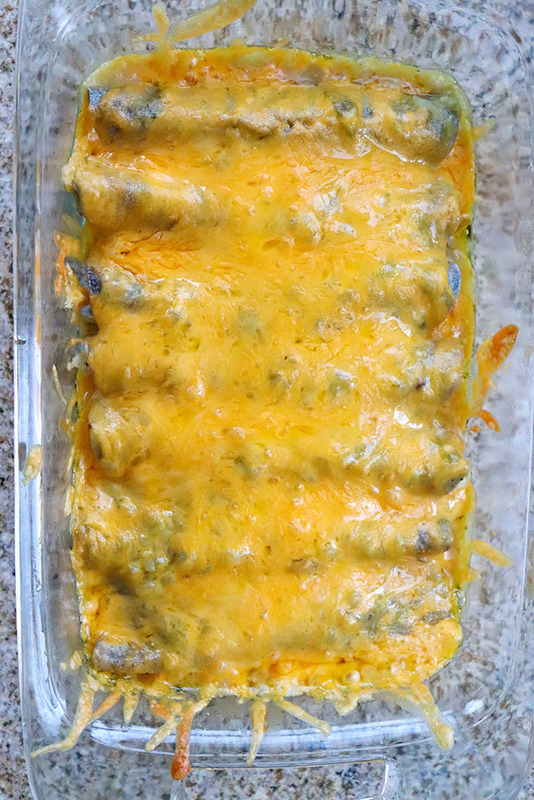 I decided to recreate a version of blue corn green chile chicken enchiladas at home. 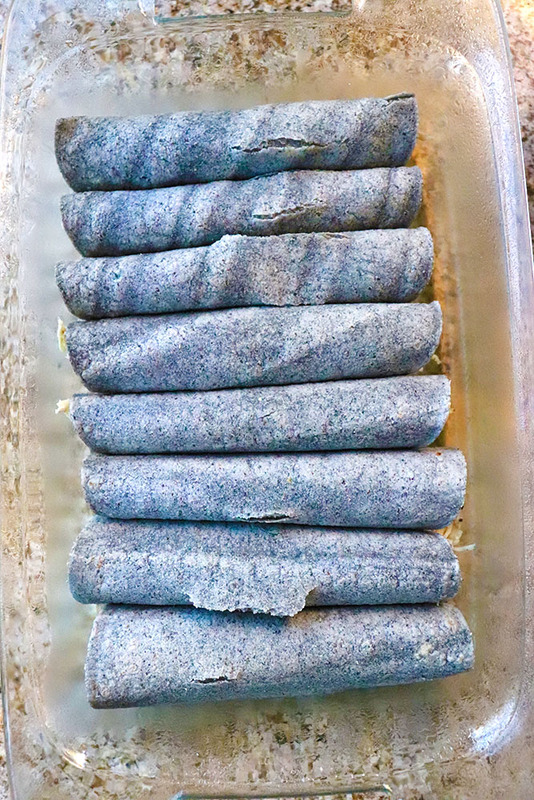 The tricky part is finding blue corn tortillas, which is apparently tricky in New Mexico, so I can’t imagine how challenging it is outside of our state. I found two brands that made blue corn tortillas that were distributed in Albuquerque, and only one was sold at retail stores. 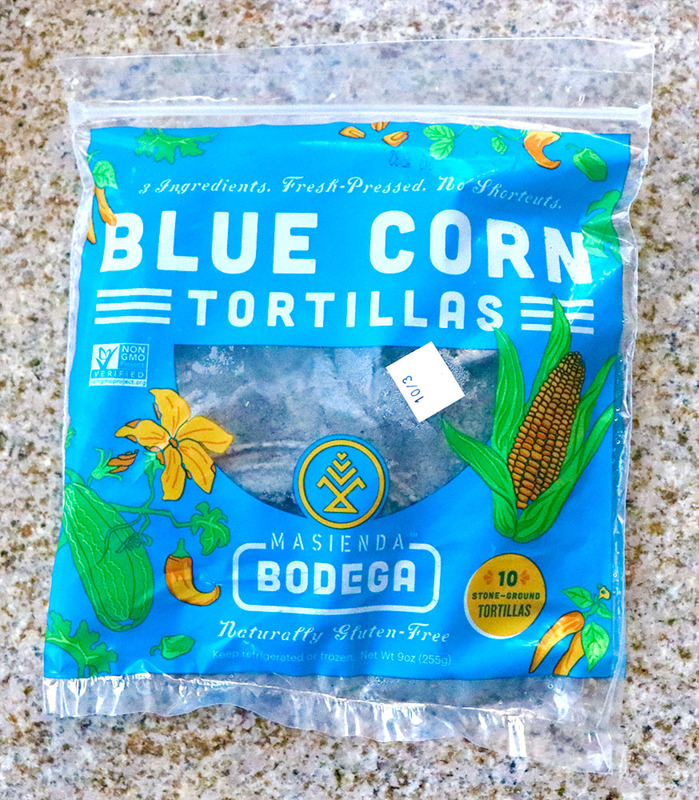 Masienda Bodega blue corn tortillas are sold at Whole Foods in Albuquerque. Not sure if it’s sold at Whole Foods in other states, but if not, you can buy blue corn flour through Amazon and make your own homemade corn tortillas. OR – you could also just use regular white or yellow corn tortillas. The taste is not that different, IMO. 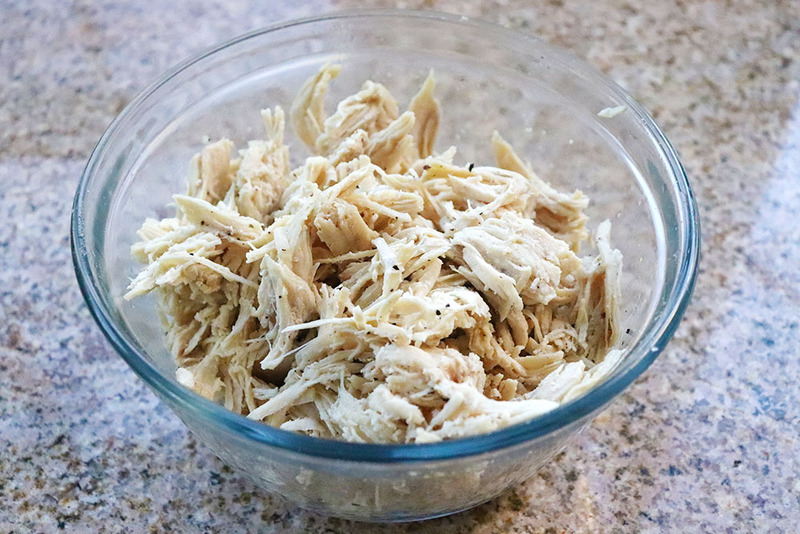 To make the shredded chicken, I boiled 2 large chicken breasts and shredded them. Then I seasoned it with salt, pepper, and garlic powder. 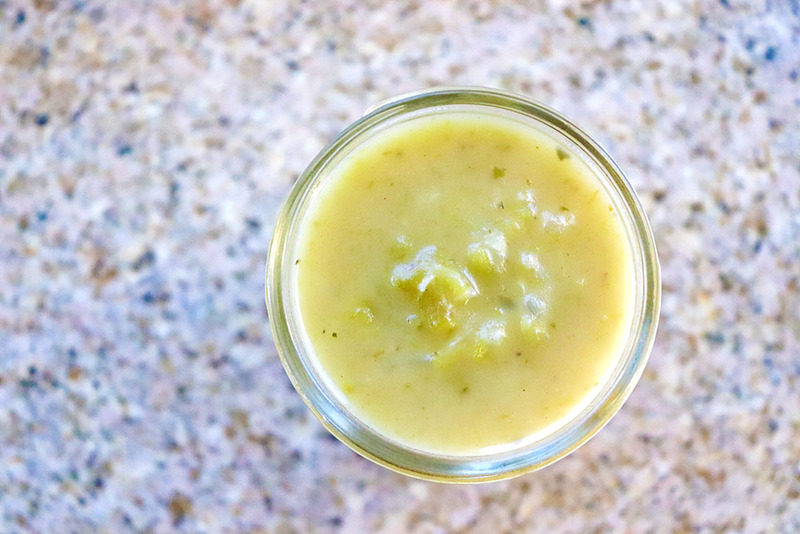 The green chile sauce is made by sauteing half an onion in 2 tbsp of oil for 5 minutes, then adding 2 garlic cloves and cooking an additional 30 seconds. 2 tbsp of flour is added and stirred until browned, then 1.5 cups chicken broth brings it to a nice consistency. I add salt and oregano for flavor, then let it simmer about 20 minutes to meld all of those beautiful flavors. 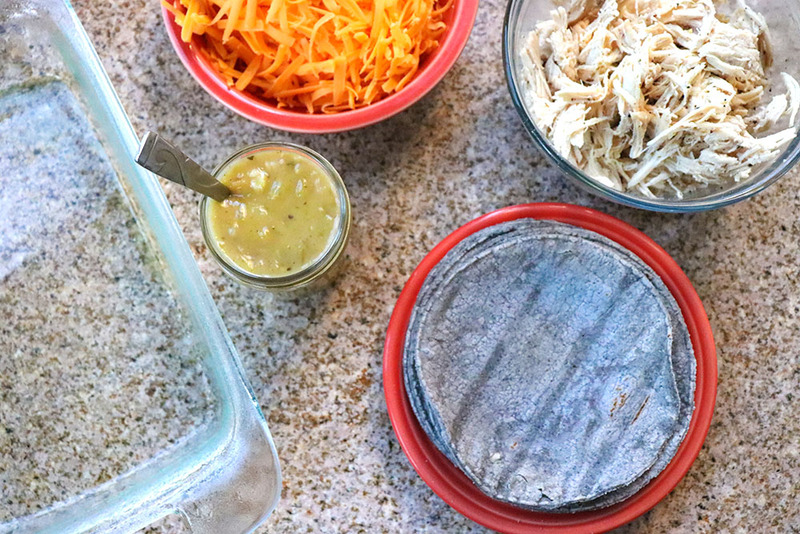 Once the chicken is cooked and the green chile enchilada sauce is made, it’s time to assemble the enchiladas! Add a bit of cooked chicken to the center of the blue corn tortillas, and roll them. *Pro Tip* – I like to microwave the corn tortillas for 30 – 60 seconds to soften them up, so they’re less likely to crack during rolling. 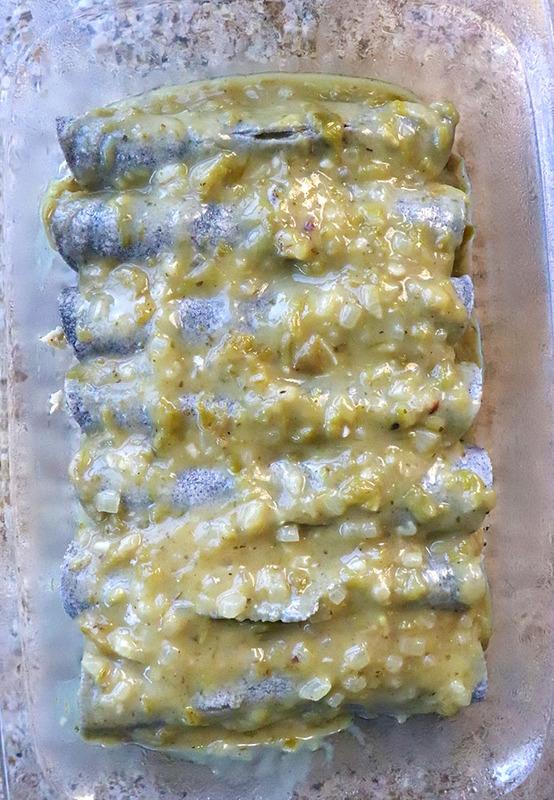 Place them seam-side down into a greased baking dish. 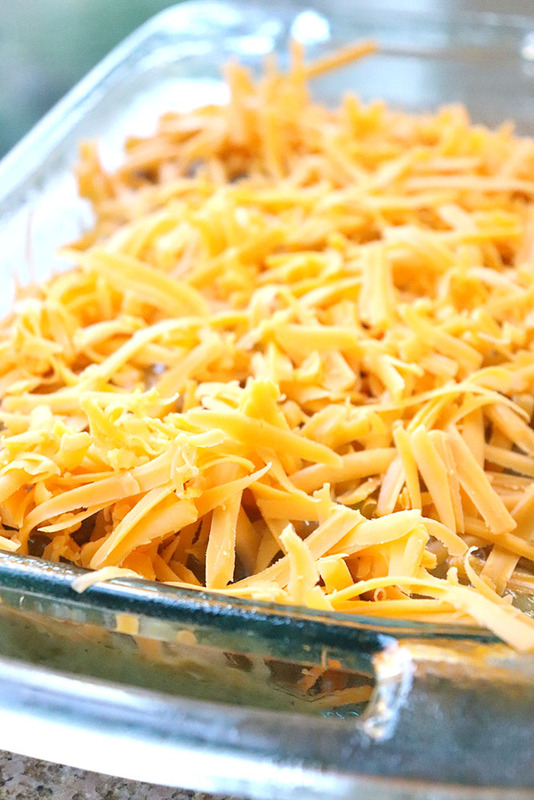 Top this beautiful combination with shredded cheddar cheese. 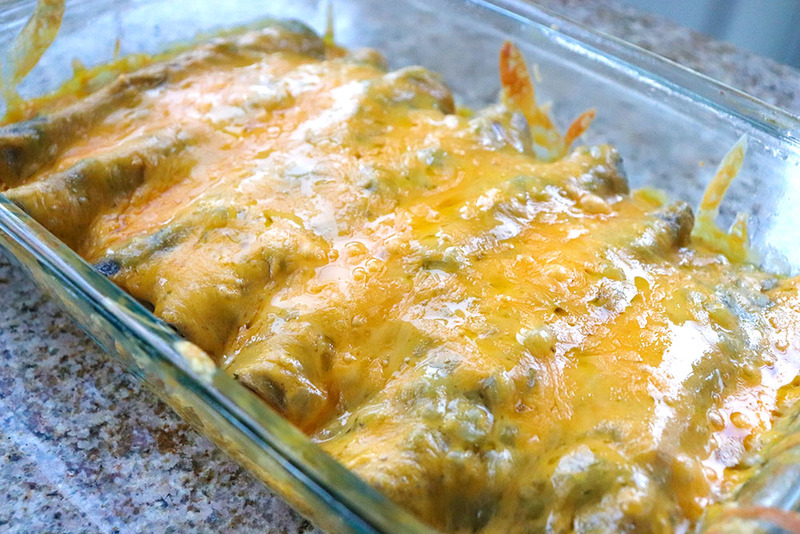 Place your blue corn green chile chicken enchiladas into the oven at 375 for about 15 minutes, until gooey, melty, and perfectly edible. And dish up! As is, with tomatoes, or cilantro, or lettuce. Maybe some sour cream, salsa, or pico de gallo. Whatever your instincts tell you, lean in! Here’s an easy-to-print recipe to hang on your fridge or share with your friend! Heat 2 tbsp olive oil over medium heat. Add onion and garlic and saute until translucent, about 5 minutes. Add in green chile and flour and cook, stirring frequently, for 2 minutes. Slowly add in chicken broth, whisking constantly, to remove any clumps. Allow to simmer 20 additional minutes, then salt and pepper to taste. Preheat oven to 375 degrees. Spray an oven=proof casserole dish. 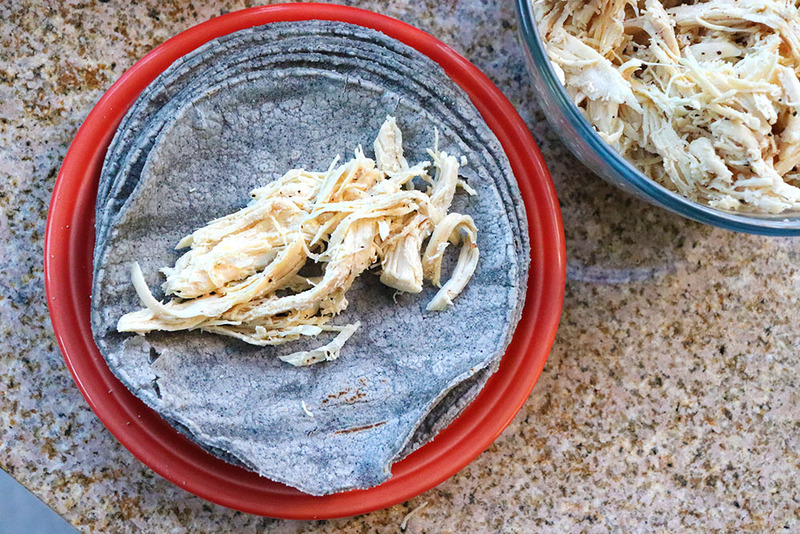 Place an ounce of shredded chicken into a line at the center of the blue corn tortilla, then roll, placing the seam side down onto the casserole dish. Save this to your favorite New Mexican food Pinterst board by clicking on the image below! This looks amazing!! But am I missing something in the green chile sauce? Where are the green chiles, and how much do. you use? Thanks!!! 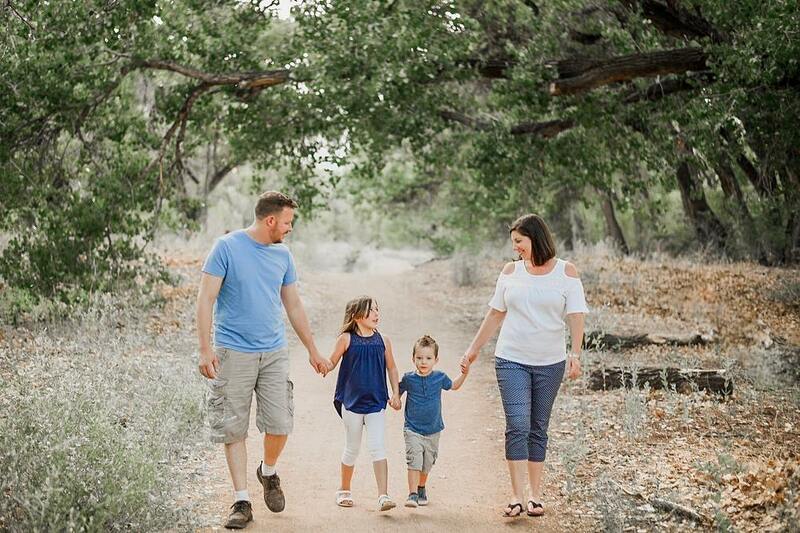 Wow – what a big ingredient I missed! I use a cup, and just updated the recipe. Thanks for letting me know!